Winner of the 2012 International Book Awards Gold Medal and the 2012 Living Now Awards Silver Medal, The Soulmate Experience has been called “A relationship guide masterpiece.” “A catalyst for transformation in life, relationships, and self.” “Inspiring, motivational, and truly remarkable.”Single, in a relationship, or married: people of all walks of life and all ages are using the ideas in this revolutionary book to create and sustain relationships that are intimately connected on all levels—emotional, intellectual, sexual, and spiritual—and a continual source of love, inspiration, and joy. In Part 1, “Creating the Love of Your Life,” chapters like “Loving Your Body,” “Reducing Your Baggage,” and “Raising Your Soulmate Potential” will help you release anything that might be preventing you from experiencing a deeply connected relationship. In Part 2, “Keeping the Life in Your Love,” chapters like “Turning Expectations into Invitations,” “Transforming the Energy of Jealousy,” and “Connecting on a Soul Level” will give you everything you need to approach even the most challenging aspects of relationships in ways that deepen your experience of love and intimacy. You will discover the secrets to keeping the love, passion, and connection in your relationship fully alive—every single day. Whether you’re on a quest for your soulmate, looking for deeper connection in the relationship you have right now, or just want to experience much more love in your life, the ground-breaking ideas in this book—and the many stories of real people putting them into practice—will fill you with love, inspiration, and possibility. We met online and immediately began a conversational exploration into life, spirituality, and, in particular, relationships. As the days went on and our conversation deepened, we didn’t feel moved to exchange photos or share details about our ages, our education, our interests, or our pasts, and yet our feeling of connection to each other only intensified. When we met in person three weeks later, one lingering kiss ignited a passion that continues to this day. Early one morning, five months and many mystical sychronicities later, we experienced a profound realization. In that moment, we looked into each other’s eyes and simply knew we were here together to do something in this world. We also knew that if we said yes to this greater purpose for our relationship, our lives were going to change dramatically. Four years later, it finally became clear to us that what we were together to do was to help others have deeply connected relationships. So we spent another four years examining our relationship, writing down our discoveries in practical, accessible language, and trying out our ideas with dozens of other people, both singles and couples. 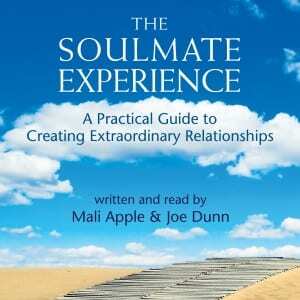 We called our book The Soulmate Experience because we knew that although finding one’s “soulmate” might be very elusive, even impossible, creating a “soulmate experience”—a relationship deeply connected on all levels: physical, emotional, intellectual, and spiritual—is available to everyone. And since our book’s publication almost two years ago, we hear from readers almost every day that it’s working. The message we’d like to give readers is this: Whether you’re single or already in a relationship, it is possible to create and sustain a profoundly connected, exciting, and deeply rewarding relationship experience. When you wrote the book did you know you were going to offer it as an audio book? Yes, eventually. Now we record the audio book at the same time the final proofing of the print book is underway, as the two processes support each other. Why did you decide to produce an audio book? Because more and more people these days are listening to information while driving, exercising, and the like. If someone is thinking about creating an audio book, what advice would you give them? Get a great microphone and create a nice sound by padding the walls and ceiling. Hire a professional editor to assist with your initial recording setup and clean up the final files. What else would you like to share with readers about your audio book? We’ve been told it makes great listening, especially the stories of real people. 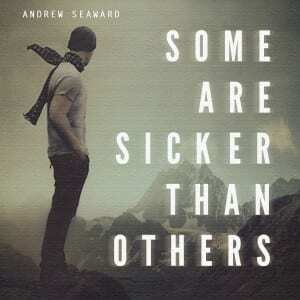 In this gripping debut novel by Andrew Seaward, the lives of three addicts converge following an accidental and horrific death. Monty Miller, a self-destructive, codependent alcoholic, is wracked by an obsession to drink himself to death as punishment for a fatal car accident he didn’t cause. Dave Bell, a former all-American track star turned washed-up high school volleyball coach, routinely chauffeurs his bus full of teens on a belly full of liquor and head full of crack. Angie Mallard, a recently divorced housewife with three estranged children, will go to any lengths to restore the family she lost to crystal meth. Though they may all be sick…SOME ARE SICKER THAN OTHERS. Based on the author’s own personal experience with substance abuse and twelve-step programs, Some Are Sicker Than Others, transcends the clichés of the typical recovery story by exploring the insidiousness of addiction and the harrowing effect it has on not just the afflicted, but everyone it touches. With the harsh realism of Brett Easton Ellis and the dark, confrontational humor of Chuck Palahniuk, Mr. Seaward takes the reader deep inside the psyche of the addict and portrays, in very explicit details, the psychological and physiological effects of withdrawal and the various stages of recovery. At first, I didn’t want to write this story. Having spent the better part of my twenties in and out of hospitals and rehabs all over the country, I wanted to get as far away from addiction and thinking about addiction as I possibly could. But I couldn’t do it. No matter how hard I tried to forget all that had happened, the memories were right there, taunting me, teasing me, reminding me just how inadequate I was. So, I did what any stubborn alcoholic with only a year of sobriety would do; I decided to face my addiction head on. I turned off my cell phone, powered on my computer, made a pot of coffee, and locked the door. But after a few weeks of staring at a blank monitor, I quickly began to realize…I wasn’t gonna remember much. As it turns out, I had drank so much and caused so much brain damage that I couldn’t really remember what had actually had occurred. I remembered bits and pieces and fragments of images, like waking up in a hospital bed strapped down by my wrists and ankles while nurses in green uniforms scurried behind me and connected tubes to my arms. But how I got there and what happened after, are all just blurs of another place and time. So, a memoir was out of the question, unless I was gonna fabricate most of it, but we all remember what happened to James Frey. What would happen if, only after a year of sobriety, I lost the only person in my life that I ever truly loved? Would I, like Monty, use it as an excuse to relapse and drink myself into oblivion? Or would I fight to stay sober and live my life clean and pure, the way that she lived hers? The answer I came up with was a little disturbing, especially for my parents, who I put through absolute hell. But, I believe it was the honest answer, the truthful answer, and I couldn’t have written it any other way. Believe me, I tried. Last Fall, I took a road trip from Long Beach to San Francisco so I could visit my godchild, Nora Wells. It was a long drive and I didn’t feel like listening to the same old albums I had listened to over and over on previous road trips. Instead, I bought the audio book version of “Moonlight Mile” Dennis Lehane’s follow-up to the thrilling “Gone Baby Gone.” Though not as good as the first, the sequel did keep my mind occupied during that high octane burn up I-5 across the dry, sun-baked fields of the California high desert. While listening to the book (and at the same time trying to avoid dirt devils) I had an epiphany; I can do this! It’s seems so easy. Just think, people could be listening to my book while caravanning across the country, or working out, or running errands, or doing whatever it is people do while listening to a book on tape. In fact, it seemed downright silly not to produce an audiobook. Just think of all the potential listeners I was missing out on – gym rats, marathon runners, commuters, blind people! It’s an untapped market, and the best thing about it is…it’s as easy as ever to get one produced. In fact, if you’re really lucky, you can do what I did, and find someone who will do it for share of the royalties. See below. ACX. AUDIO CREATION EXCHANGE. Probably the best thing to happen to audiobooks since the advent of the iPod. Not only can you find dozens of quality, voice-over professionals in once central location, you can get them to competitively bid on your books in a way that helps drive down the cost of production. In fact, as I mentioned above, I was lucky enough to find a very talented voice over actor by the name of Andrew Wehrlen, who was willing to produce the book for a share of the royalties. This is great for two reasons. The first, obviously being I don’t have to pay any money up front. The second is that I have another person financially invested in the success of the audiobook who will go to great lengths to help me reach my audience. Why? Because for any sales I make, 50% goes into his pocket. So, he has what I call “marketing motivation.” Also, being a voice-over professional, he already knows where all the listeners hang out. Unfortunately, not everyone will be as fortunate as I was in finding an inexpensive source of audio book production. Andrew happened to have a very personal connection with my story. Without going into too much detail, Andrew has had some experience with people (not himself, but family members) dealing with and sometimes succumbing to the insidiousness of addiction. Due to the intense personal connection he made with the characters in the story, Andrew was willing to help me out by doing what he does best: narration and production. It was as simple as that. The fact that his voice was more natural and “layered” than even Robert Downey Jr’s was just icing on the cake. I will definitely be using Andrew’s services for my next project. Trust your voice-over professional. They know what they’re doing. Chances are, they’ve done a lot more of these than you. From the darkness of a six by eight foot cell in solitary confinement to the top of the highest peak in the Western Hemisphere, this is the captivating story of one man’s struggle to recover from a troubled past. Charlie is known to his friends as an accomplished mountain climber and entertaining storyteller. Few know the story of his childhood, filled with neglect and abuse. Fewer still realize that he spent seven years of his youth in the shadow of juvenile detention and prison. After relegating those painful memories to a place far from his current life, Charlie is confronted with his past as he tries to enter Canada for an ice climbing vacation with friends. “Have you ever been convicted of a felony?” the Canadian Border Services Officer inquired. “No,” I responded with a straight face and sweaty palms. “Are you sure you’ve never been convicted of a felony?” he repeated. “Not since 1955,” I admitted, guiltily. So began my journey back in time to a place I thought I had forever left behind. 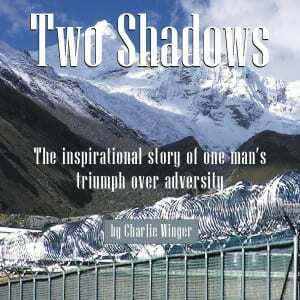 Charlie faces his past once again, finding strength in his unconquerable spirit, unique sense of humor, and the focus he’s found through his passion for mountaineering. He takes you from the tenements and alleys of pre-World War II Chicago through jails, reformatories, and the hell that was prison. From solitary confinement to the jungles of the Amazon, the heights of the Himalayas, the isolation of the desert Southwest, and many points in between. His story will move you, entertain you, frustrate you, and ultimately inspire you to turn the dark shadows of life into the triumphant shadows cast by the mountains you climb — whatever form they may take. For decades I had been tinkering with writing a novel based on my life. Being denied entry to Canada for an ice climbing trip several years ago brought many difficult and painful memories to mind — memories which I thought I had set aside for good. Finally, following a climbing accident at age 72, I found myself flat on my back for months. I had plenty of time to think and reflect, and plenty of time to write. I wanted to tell the true story of my life to demonstrate how extremely difficult obstacles early in life can be overcome. I’m proud of how my life turned out, and hope others can be inspired by my story. Plus, I love telling climbing stories. When you wrote the book did you know you were going to offer it as an audio book? No, that hadn’t occurred to me. I daydreamed of having a movie made about my life, but so far nothing’s happening in that department. The audio book was actually my wife’s idea. Diane is the “publicist” for all our books — even the ones with traditional publishers. Two Shadows is a book filled with tales, so it seemed to lend itself very well to audio. We imagine many climbers will listen to it during road trips and while backpacking, and hope it will get them psyched up for their own adventures. We’ve had good experiences with Amazon’s Kindle program and thought using ACX (another Amazon company) to search for a narrator would be a good fit. We listened to a number of audio samples to find voices and styles which seemed right for the job, then asked a few narrators to submit auditions. We intentionally chose excerpts from the book with very different moods: straight narrative, a dramatic mountaineering situation, and a humorous section. We’re very pleased with the results from using Paul Kelly to narrate the book. Barnes returns to Valley End High, this time with bits of his lost memory returning. Find out what happens when he finally learns the dark secret behind the largest high school in the world. Part of the LYCCYX universe, the Valley End High series describes some of the events that take place on Earth while the main story of LYCCYX focuses on the lunar colony know as LB127. I wanted to explore what takes place on Earth while the main story of LYCCYX occurs. Barnes is an interesting character in a unique predicament. In the first installment, Valley End High, he has just found himself starting a new job as a security officer at the largest high school in the world. He has no memory of anything before that morning. He has no idea why he is working there and has an uncomfortable feeling that this place may not be what it appears to be on the surface. When you wrote the book did you know you were going to offer it as an audio book? 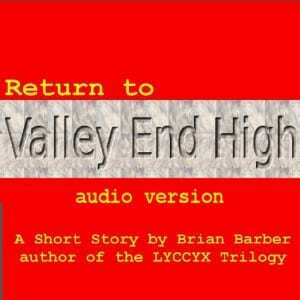 My first audiobook, A Stormy Night, did extremely well and I figured I might as well use ACX to create an audio version of the Valley End High series. These are perfect for when you want a complete experience but don’t have the time to invest in a full-length novel. ACX made that all so simple. I heard about them shortly after publishing my first eBook and decided to give them a try. Eric Nutting sent me an audition for Valley End High and I really felt that he captured the character of Barnes perfectly. I immediately asked if he would do both stories in the series and was delighted that he agreed. Try ACX, especially if you already have eBooks on Amazon. I couldn’t imagine an easier way to produce a quality audiobook. What else would you like to share with readers about your audio book? Sometimes being a geneticist isn’t enough to understand your family…. Joanna Lyon is the great-granddaughter of the legendary TwenCen musician Sean Lyon. She may have inherited her ancestor’s musical talent, but her parents’ bitter divorce and her Uncle Jack’s attempts to remake her into another Sean have left her hostile toward her family and music. Her passion is for science, but since she has no access to the family funds, she struggles to earn enough credits for graduate school. Then her uncle sets up a business deal with her employer to make Joanna go on a mission for him: travel via the spaceship Sagan to an alternate TwenCen universe where Sean is still alive. Joanna must collect a DNA sample from Sean so her uncle can create a clone of him. She refuses at first, but finally agrees to go. Secretly, however, Joanna believes her uncle will exploit the clone, and she plans to sabotage the project to stop him. 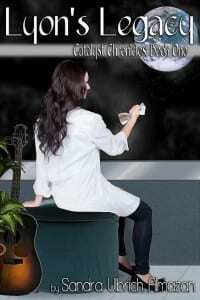 But when she falls in love with one of the scientists in the Sagan’s genetics lab, clashes with other time travelers who fear she’ll change how history develops on the alternative TwenCen Earth, and receives devastating personal news, Joanna will find herself pushed to her limit even before she comes face-to-face with her hated ancestor. Their encounter will leave her changed forever. Will she still be able to thwart her uncle’s plan, and what will she have to sacrifice to do so? I’m a big Beatles fan and wanted to write a scene with an observer from the future traveling back in time to watch them perform at the Cavern in Liverpool. From there, I started asking myself questions as to why the traveler was there and what her goal was. This helped me developed my main character, Joanna. I eventually rewrote the story to be about a fictional rock star instead of the Beatles, but I tried to retain some of their flavor. When you wrote the book did you know you were going to offer it as an audio book? No, I didn’t know how easy it was for independent authors to create audiobooks of their work until after I’ve already published Lyon’s Legacy. I put my book into audio format so it could reach a wider audience. I submitted my audiobook project through ACX. A couple of people auditioned for the work, but the second reader did a great job of capturing my main character’s personality. Go through Audiobook Creation Exchange (https://www.acx.com/). It’s a service that connects authors with producers and narrators, then distributes the finished project.